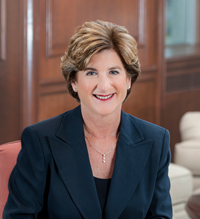 As part of our ongoing series of conversations with leaders in sustainability, we asked BSR Conference 2015 plenary speaker and Campbell Soup Company President and CEO Denise Morrison to share her thoughts on the role of resilience at her company and in leadership more broadly. Eva Dienel: How are you focusing on resilience at Campbell Soup Company? Denise Morrison: It’s interesting that the Merriam-Webster definition of resilience focuses not only on flexibility, as in the ability to get pulled and stretched and return to one’s original shape, but also on spirit, as in being tough and strong enough to be successful after setbacks. At Campbell, and indeed throughout the consumer packaged-goods industry, we are navigating seismic consumer shifts in demographics and family structure, health and wellness, digital commerce, and the ever-changing middle class in both developed and emerging markets. We feel the unceasing pressure to operate differently—perhaps not to return to our original shape, but to tough it out and emerge in a new and better one. Only through both flexibility and spirit will we thrive in this chaotic, pulling-and-stretching environment. We must be agile enough to identify trends, make decisions, and try new things quickly, and resilient enough to rebound and redirect as needed. One of the most galvanizing things we have done has been to articulate our company purpose: Real food that matters for life’s moments. It is aspirational, inspirational, and perspirational! We are driven to define the future of real food and are committed to it both rationally and emotionally. You see, being an iconic food company can be both a blessing and a curse. It can be a curse if, amid change, you maintain the status quo. It is a blessing if you leverage the change coupled with the capability to seize new opportunities. At Campbell, we are reshaping our company to respond. Managing through change both requires and breeds resilience. We can either be a victim of change or lead it—and it’s much more fun to lead it. Dienel: What kind of leadership is required today to create a resilient future? Morrison: It may sound overly simple, but leaders today need to lead from the front. They have to possess the values of character, defined by high integrity, competence, and teamwork. Most important, it is imperative for leaders to have the courage to change or take a stand with an unwavering sense of purpose—to set the agenda and the vision. Finally, leadership is about inspiring and motivating people to have the resilience to reach their individual and collective potential, and to be truly excited about the journey and their role in it. I recently challenged the members of my global leadership team to push themselves even further and to lead by example. I hold them accountable to be visible among their teams, to drive a high-performance culture, and to actively help their people manage through the seismic shifts that are impacting our industry. Now is the time for all leaders to encourage and enable their teams to become the high-performers we all want to be—the teams that will ideally position their organization for a bright and resilient future that can withstand and triumph over any and all winds of change, however fiercely they may blow.